Hi, I am interested in your 1966 Chevrolet C/K Truck (stock #165529) listed on Autotrader for $16,000. I'd like to get more information about this vehicle and confirm its availability. 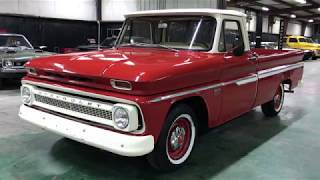 1966 Chevrolet C10 pickup. VIN C1546S165529. Original, numbers matching, 283ci V8 / 4 speed manual transmission. •Good body with decent red paint (original color). •New whitewall radial tires on factory steel wheels. •Interior is in good condition overall. •Factory bench seat looks great. •Original, matching numbers, 283ci V8 engine. •Original Service Parts Identification Decal.